The Purbeck Society began in the 1850s as a ‘Naturalist and Antiquarian Society’ and was typical of many learned societies founded around that time. Its early members were local scientists but ‘those who may be merely casual observers of nature’ were also encouraged to join. Of course everyone was an amateur in those days, but some people in the Society had considerable expertise, especially those from the educated clergy. 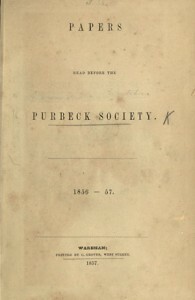 The introductory lecture took place in Corfe in November 1855. The Society had a particular aim. It was realised that the undeveloped area of the traditional Isle of Purbeck had never been explored scientifically. Very little was known about the wildlife or the history hidden in features of its diverse landscape. The Society, therefore, began as a project to collect and catalogue as much information as possible about the creatures and plants, fossils and ancient history of the Isle. This was to be circulated as a contribution to scientific knowledge, and, indeed, papers read before the Society were eventually published. It is interesting to note that this work began before the publication of Darwin’s On the Origin of Species in 1859.